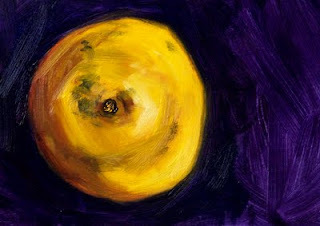 This is the third in my recent series of apple paintings. 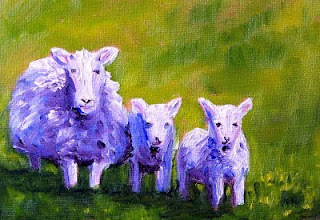 All are quite different; all were fun to paint. 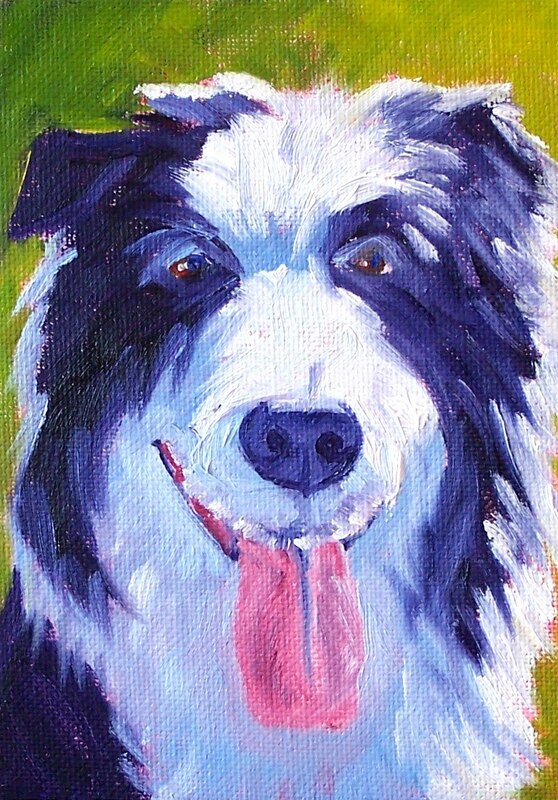 This one was created with oil paint on an 8x8 inch stretched canvas. I like the bright red. 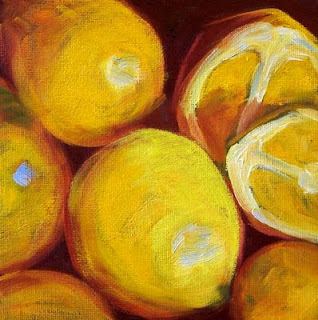 When it is dry, I will sell it at Small Impressions Gallery along with some of my other small still life oil paintings. Apples are still on my agenda for painting. I enjoyed mixing all the colors before painting. 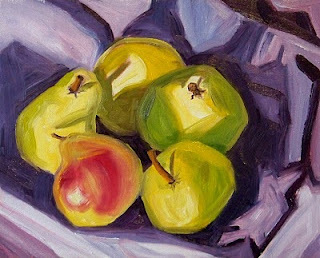 Then I worked in a paint by numbers style only blending where each color met the next to avoid sharp edges on the skin of the apples. It was fun and the effect was pleasing. I'll be playing with this style again in the future. The painting is an 8x10 inch oil painting on a gessoed hardboard panel. This little painting was inspired by the first chapter in Michael Pollan's book, The Botany of Desire: A Plant's-eye View of the World. It is a delightful book about the evolution of four domesticated plants, the apple, the tulip, marijuana, and the potato. Though it sounds odd to write an entire book on just four plants, it is truly a delightful read. 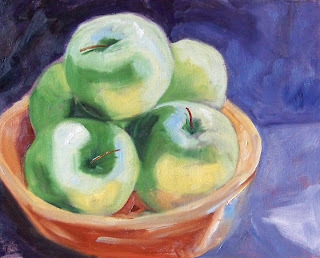 I learned so much about the history and evolution of the simple apple, that I've been painting apples all morning. 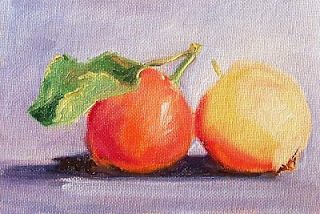 These little crab apples are on a 4x6 inch canvas panel. 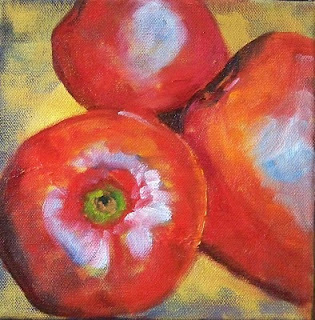 They have joined some of my other small still life paintings at Small Impressions Gallery and can be purchased here for $24.00 plus $6.50 for shipping to US addresses. I've just begun the second chapter on the tulip. Pollan's style is refreshing, fun, and inspires me to paint. Tulips are next; I wonder what will happen when I get to the chapter on marijuana. Longing for a little warmth in this winter season helps me to recall the excitement a little sunshine brings in the early spring. 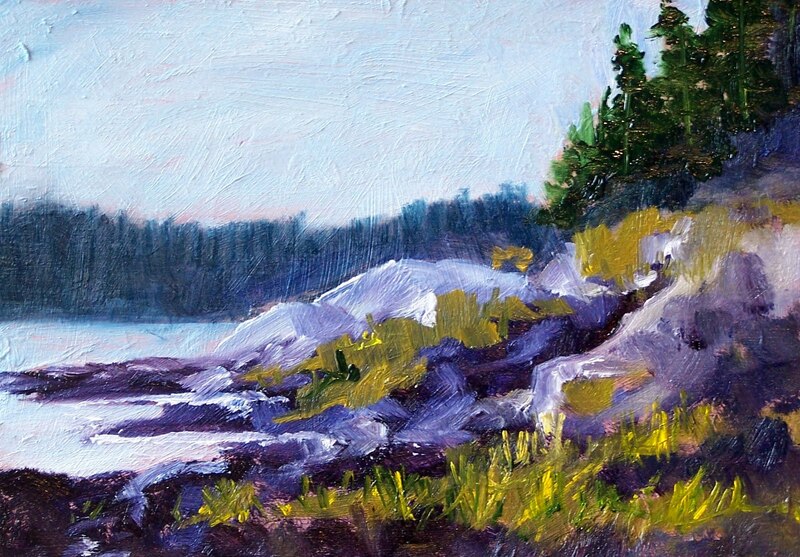 I tried to capture some of that sunshine in this little 5x7 inch oil painting. It is for sale for $50.00 plus $6.50 for shipping to US addresses along with some of my other small oil paintings at Small Impressions Gallery. It can be purchased with a click on this link. It has been cold in the Pacific Northwest, but in order to get snow, we have to travel to the mounatins. The Cascades and Olympic ranges are close by, so if the desire for snow surfaces, we head for the hills. My trip to the hills today was imaginary. I was perfectly happy sitting in my warm studio painting this show scene. 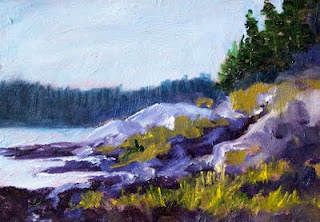 It is 5x7 inches on a gessoed hardboard panel. 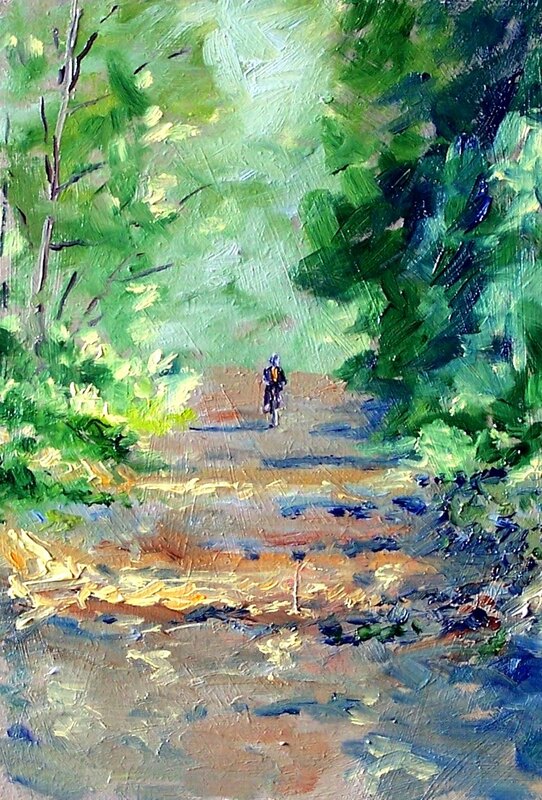 When it is dry, it will join some of my other small oil paintings at Small Impressions Gallery. 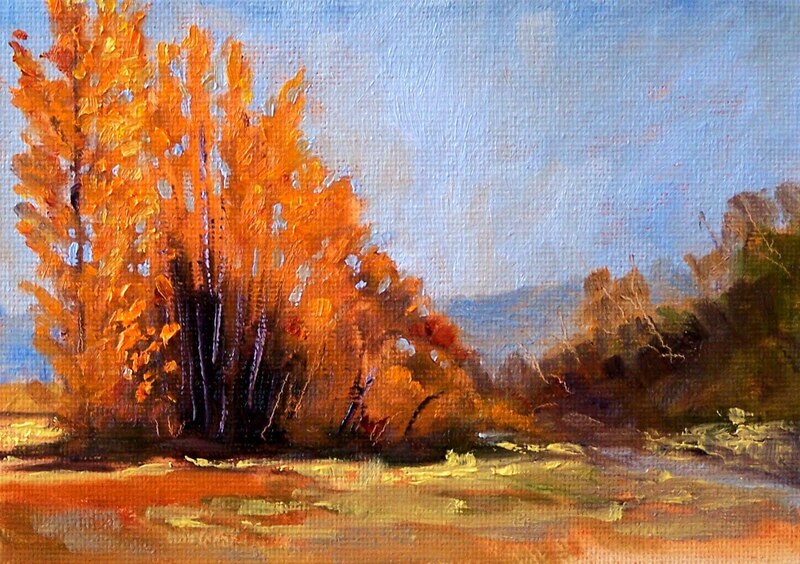 Today's 5x7 inch painting is another bright little experiment with color and value. Remembering that there are five kinds of light on an object helped with decisions. Titanium White, Cadmium Yellow, Cadmium Orange, Alizarin Crimson, and Ultramarine blue made up my palette. Usually I'm not much of a floral painter, but the absence of sunshine in the middle of winter has prompted me to think sunny thoughts. 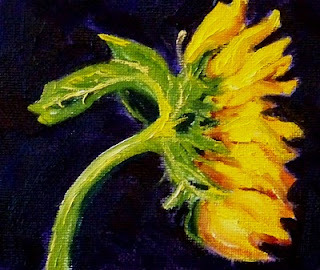 This 4x5 inch oil painting of a lone sunflower helped bring some sunshine into my studio. The painting is for sale at Small Impressions Gallery with some of my other small paintings and can bring some sunshine to your home, too. 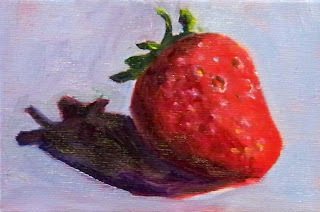 Click here to purchase this miniature painting for $20.00 plus $6.50 for shipping to US addresses. This is a 18x24 inch painting that I started last summer. I've never been satisfied with it. Today it came out of the closet and landed on my easel again. There were two problems that particularly bothered me. The road was too bright, too busy, and distracting, so I toned it down with an overcoat of warm gray. I like it much better now. In addition, the trees were dull and flat. 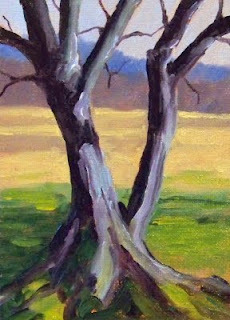 I brightened up the trunks with a little cadmium orange and added some light to the left side of the left tree. I'm still not certain the trees are what I want, but the road is definitely an improvement. After it dries, I'll probably stare at it for a few more months before deciding its future. It may eventually enter Impressions Gallery with some of my other larger paintings. 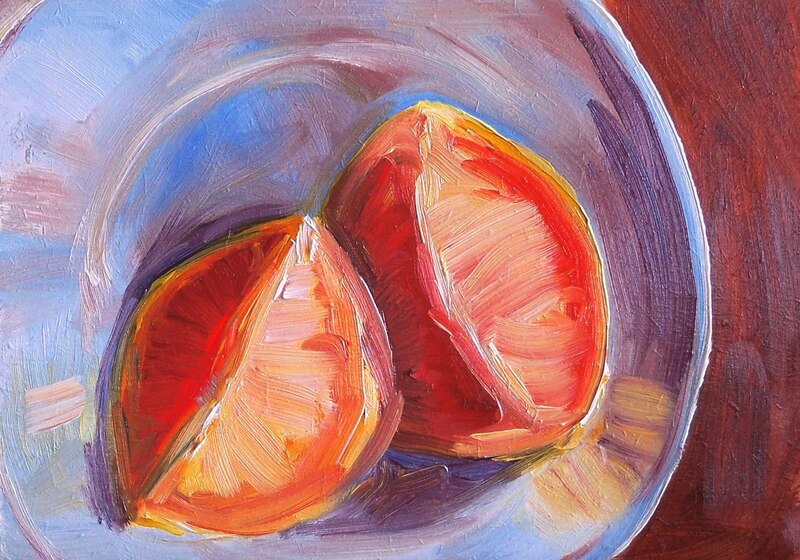 One of the things I love most about painting still life is the bright colors of fruit. It is a challenge to mix my paints so that the values work to develop a three-dimensional feel on a two-dimentional surface. I was pleased that when I pulled it off with a limited palette. 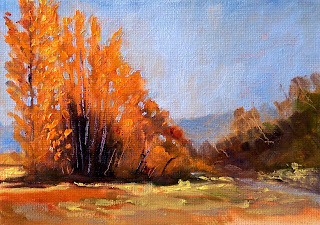 Developing just the right mixes with Alizarin Crimson, Ultramarine Blue, and Titanium White worked well in this little 5x7 inch painting. It is for sale at Small Impressions Gallery and can be purchased for $35.00 plus $6.50 for shipping to US addresses. Last fall on one of my bicycle trips through the Orting Valley in Pierce County, Washington State, I snapped a picture of trees on the bank of the Carbon River. 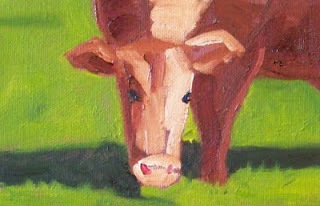 Eventually, the photograph came forward and inspired this little 3x5 inch oil painting. The size is smaller than my usual small format paintings. There are many artists that paint even smaller using brushes with only one or two bristles and a toothpick. I don't have quite that much patience. Nevertheless, it took me a long time to develop this one to my liking. At first, the paint sunk in and created dull results. Since I like my paintings vibrant, I reworked it a second time after it was dry. The results were much better the second time over, but my next challenge was the photography. Not being a professional photographer by any means, I kept getting blurry results and the colors still seemed dull. Perhaps it is the size, perhaps the lighting in the gray depths of winter, but I've finally settled on this photo of my little painting. It is still much more attractive in person. When it finally dries, it will be listed for sale at Small Impressions Gallery . 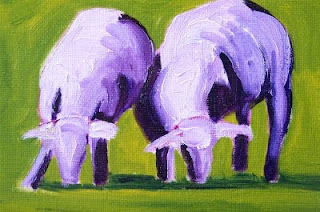 I still have several of these 3x5 inch canvases in my studio. Perhaps I'll have to invest in some toothpicks and small brushes. 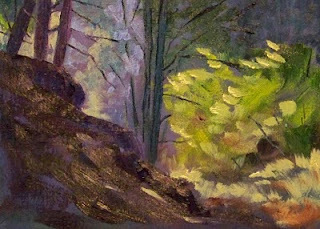 Today's painting was inspired by a bright spot in the forest. This time of year, hiking in the woods in the Pacific Northwest is often a gloomy trek. Damp fog, rain, and eternal grayness abounds with only a small glimpse of color now and again. Walking around a bend and gathering a glimpse of color reminds me that spring will come again. This oil painting is 5x7 inches on a gessoed hardboard panel and was inspired by a little glimpse of woodland color. When it dries it may join some of my other small landscape paintings at Small Impressions Gallery. 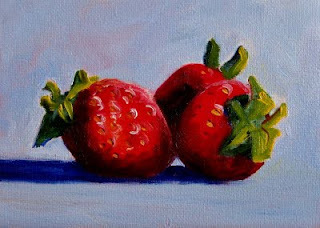 Painting these little strawberries in the midst of winter has been a real pleasure. 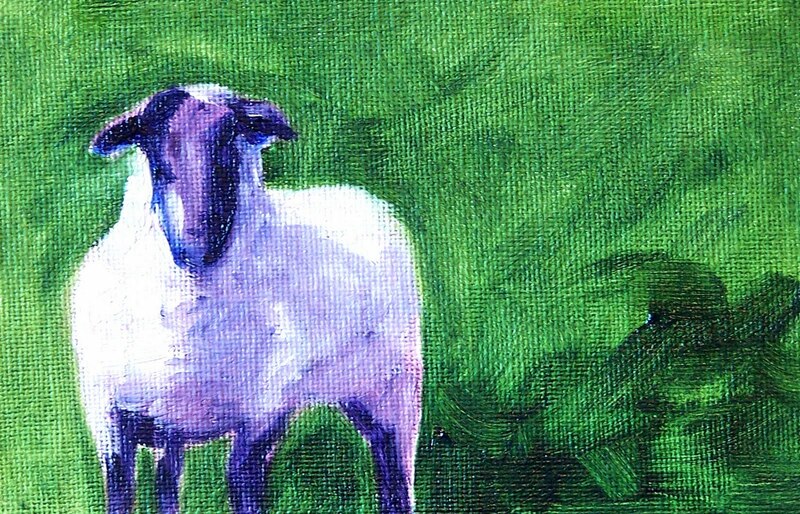 This one is 4x6 inches on a canvas panel. 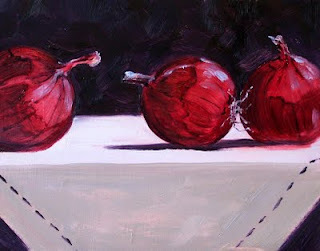 Eventually it will join some of my small still life paintings at Small Impressions Gallery. 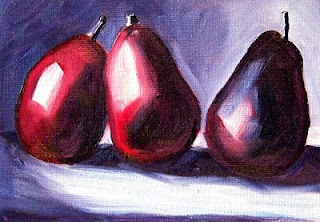 Today's painting is an 8x10 abstract still life. A group of pears sitting in strong sunlight create interesting shadows upon each other and the fabric upon which they are sitting. It was the patterns and colors that interested me more than the fruit itself. 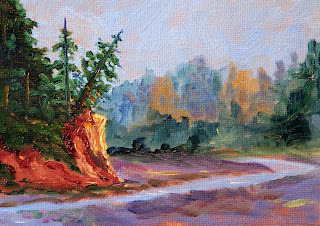 I was glad to find the time to paint during this busy holiday season and regret that I can't find more I'm looking forward to a day of uninterrupted painting time. Hope it comes soon. The weather is cold, the trees are bare, and there is no question we are in the middle of the winter season. The good part is, in just ten days, our days in the northern hemisphere will be getting longer again. 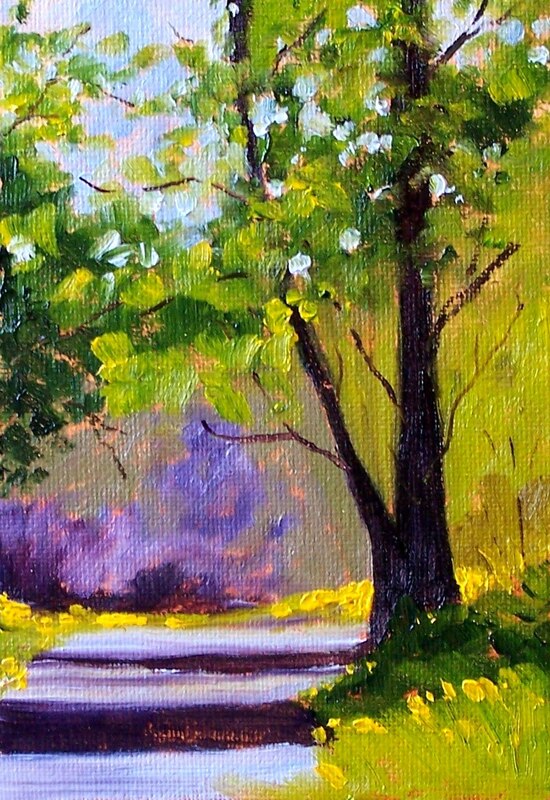 Todays 5x7 inch oil painting is of a tree that is waiting, just like me, for early signs of spring. We've had our fill of dark, cold days and long for the warmer days of spring. Eventually this little painting will join some of my other landscape oil paintings at the Small Impressions Gallery. 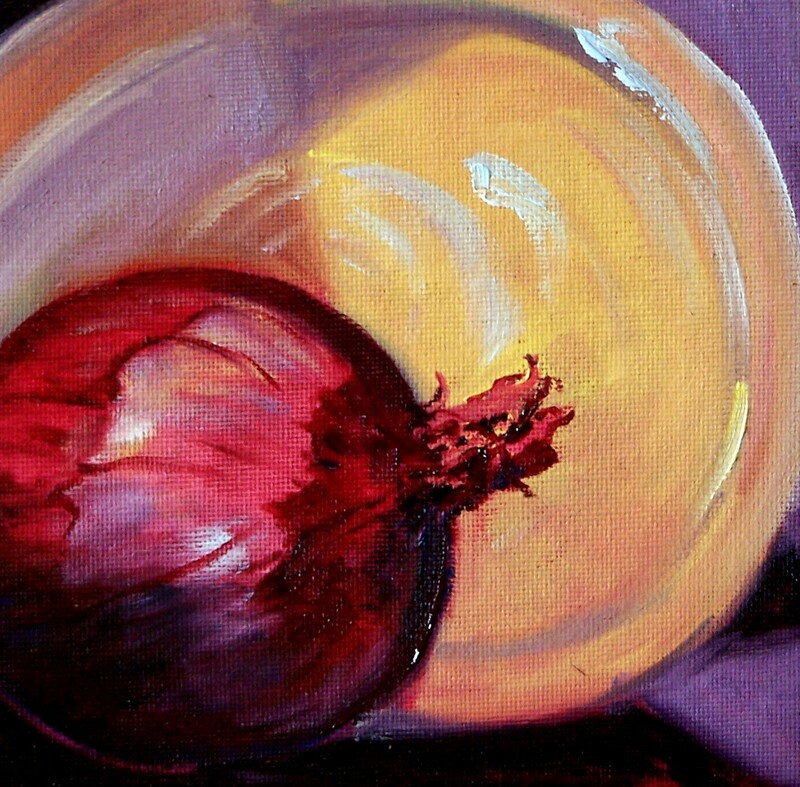 Painting small is a great way to test ideas for larger paintings. I paint often which gives me the opportunity to try out a lot of different designs. 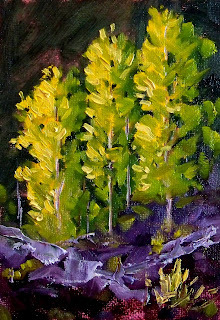 This is a small 5x7 inch abstract oil painting was great for working on color and value in a very simple design. For it to work as a large painting, it would have to be very large. I'd love to create in about a 5x6 foot format. Unfortunately, my studio isn't big enough for me to work on something that large. Maybe someday I'll have room to create some ambitious sizes. For now, about half that size is all I can accomodate. Therefore, I'm selling this little piece of art at Small Impressions Gallery for $50.00 plus $6.50 for shipping to US addresses. I've been playing with this stand of trees for a couple of days now. 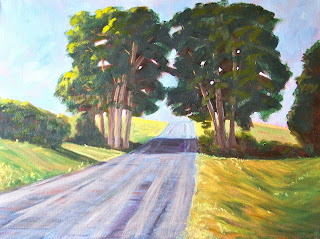 In today's painting, I have altered the number of trees, the background and foreground, and the shape and size of the support on which it was painted. When I compare this painting and yesterday's painting of the same subject I find elements in each that I both like and dislike. What I like about this painting over yesterday's is the foreground and background which is uncluttered and doesn't distract focus from the trees. 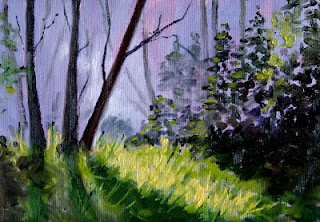 I like the contrast of dark and light, and I like the combination of green and violet. 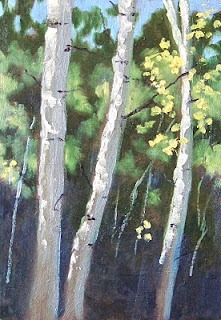 In yesterday's painting, I like the way the four trees read as three, with the little one hiding in the shadows. Should I paint this subject a third time? I'll ponder that question for a few days. This group of trees held onto their leaves in spite of the shivery weather of winter. 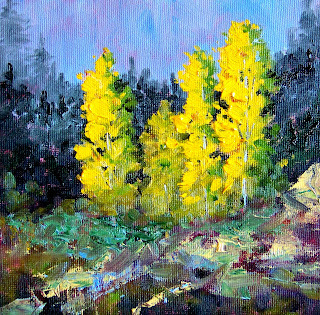 They stood out amongst the evergreens and I felt inspired to paint the bright color. 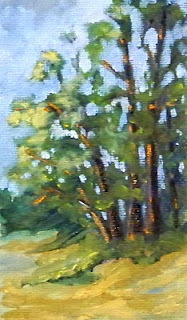 The painting is 6x6 inches on a canvas panel and will eventually find its way to the Small Impressions Gallery with some of my other small landscape paintings. Yes, they're out of season, but I couldn't help it. I wish we had the warm weather that comes with strawberry season. All week the temp is expected to stay below freezing. I just want it to warm up! 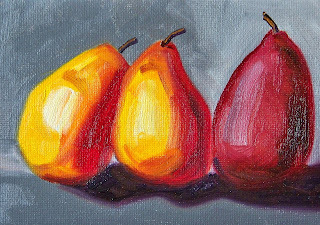 Eventually this little 5x7 painting will join some of my other small still life oil paintings in Small Impressions Gallery. In the meantime, I shall dream of sweet berries and warm weather. This weekend was spent on the Washington Coast, just south of Forks, Washington, where the Twilight books and movie take place. It was cold and damp, I guess a perfect place for those vampire scenes. 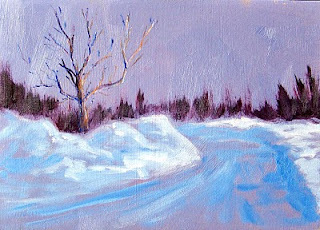 It was a relief that it wasn't raining, but the wind was bone chilling and the fog crept in providing a ghostly background for my little 5x7 inch oil painting. When it dries it will join some of my other small oil paintings at Small Impressions Gallery. I've been messing around with my new camera. I wanted something with more than my previous 4 pixels and considered a new digital SLR, but the price lead me down the path of an advanced point and shoot with a built-in zoom and the ability to make manual adjustments. 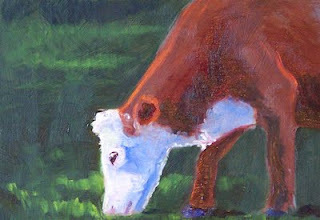 I've photographed this little cow painting over and over again trying to reach the magic moment when I was completely satisfied. I'm still not there and can't decide whether it is the camera or my monsterous lack of skill. It might even be a little of both. I know professional photographers can create reproductions that are difficult to differentiate from original paintings, but to me, my little oil paintings still looks better in person. My husband says I'm a perfectionist and I'll never be satisfied. I will keep trying. This little painting, one of my efforts at getting the perfect photo, was listed at the Small Impressions Gallery, but has recently sold. It looks a lot better in person. 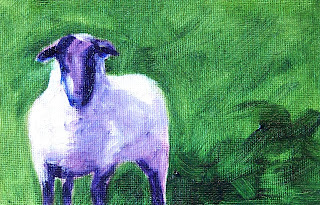 It is 4x6 inches on a canvas panel. 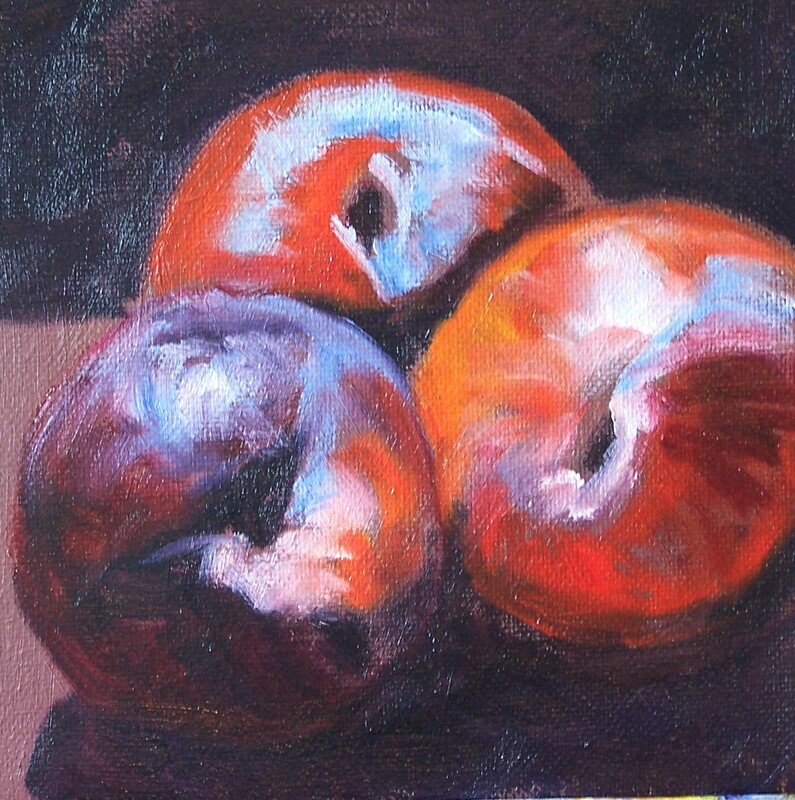 Today's painting is 8x8 inches on a stretched canvas. Originally there was another painting underneath, but I didn't like it. It had been kicking around in my studio for a while; I hated to toss it and had planned to take the canvas off and replace it with new canvas. On an impulse I began painting right on top of the existing painting. 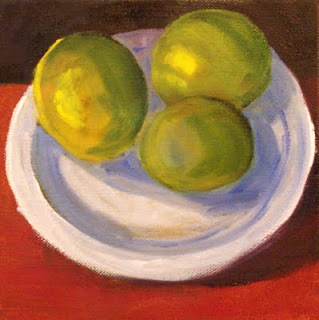 The foreground is the original, but the limes and the white plate emerged as I continued painting. Though the perspective is off, I like the abstract quality of it. I may eventually sell it, but in the meantime, I'm enjoying having this new little painting in my house. Three is a good number. 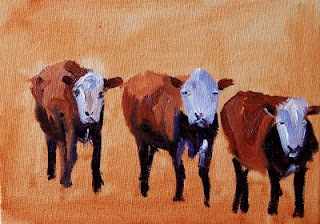 I've found comfort in painting subjects in triplicate. 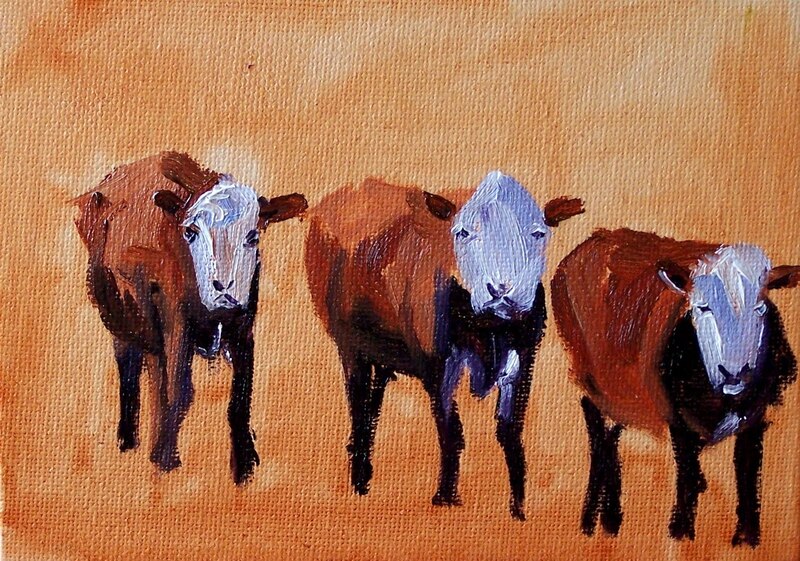 Three sheep, three cows, three onions, three lemons. When I paint things in pairs, I don't have the same emotional response. It feels unbalanced which is odd since logic would dictate that even numbers--two or four or six--would be more balanced. Isn't that how a scale finds its center? Yet I am oddly attracted to the asymetrical.